Soviet sculptor Lev Kerbel was the Professor, Academician, and Vice-President of the USSR Academy of Arts from 1988 to 2003. He was the People’s Artist of the USSR (1977), Hero of Socialist Labor (1985), winner of the Lenin Prize (1961) and the first degree of the Stalin Prize (1950). Member of the CPSU since 1963, Lev Efimovich Kerbel – author of more than 50 monuments and memorials installed in the USSR and overseas. 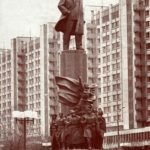 He created a large number of statues of prominent figures of the Communist Party, Soviet politicians, generals, heroes of the Soviet Union and Socialist Labor. Together with the vice-president of the Academy of Arts M. Manizer Kerbel executed death mask of Stalin. Lev Yefimovich Kerbel was born November 7, 1917 in the village of Semenovka of Chernigov province of the Russian republic. 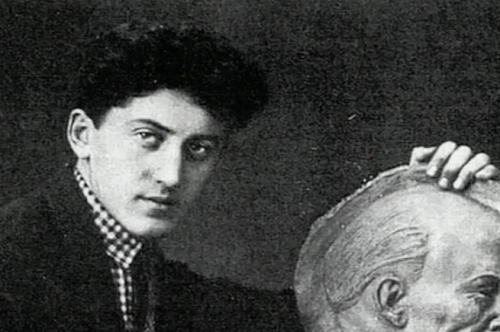 Father of the sculptor – Efim Abramovich (1889-1953), worked as a clerk, after the October Revolution joined the Communist Party (b), worked at state commercial system; mother – Zlata losifovna (1894-1965), a housewife. During the Civil War the family of Kerbel moved from town to town. One time they lived in Novozybkovo, then in Simbirsk. After the war settled in Smolensk. Lev’s father got a job in the administrative sector of the communist party, and the family was given an apartment. In 1925, Lev began studying in the 5th Smolensk nine-year school of Krupskaya (former grammar gymnasium). There he became interested in biology seriously, and even planned to enter the biological faculty of Moscow State University named after MV Lomonosov. Interest and obvious ability to artistic creativity Lev Yefimovich opened in early childhood, around the age of 6 years. The future sculptor recalled it this way: “When Lenin died, I was a little more than six. Adults were crying – my grandfather, my mother. Then Lenin was more than God. I was so impressed and I began to draw. I copied a photo from the magazine “Red Field” where Lenin was lying in a coffin. One of my father’s friends saw the drawing and said, “Listen, he draws very well” I guess how it all went”. At school Kerbel continued his art, especially moldings. At one of the children’s art school competitions he won first prize in the form of a camera “Photocor number 1” for comic clay composition “I and my Masha at Samovar”. 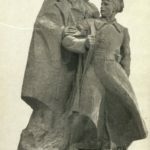 The first serious recognition of his artistic talent Lev Yefimovich felt in the 9th grade (1933), when his work – the bas-relief of Lenin was highly appreciated on the regional stage of the Amateur Art Olympiad. 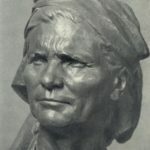 This creative success in the will play an important role in the life of a young Kerbel, it was then that he decided to become a professional sculptor. After High School Smolensk Regional Board of Education and the Regional Committee of the Young Communist League sent a petition to the People’s Commissariat of Education of the RSFSR with a request to assist the young and promising artist Lev Kerbel in getting higher art education. As a result, the ministry felt it necessary to invite the young man to Moscow. 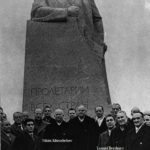 Meanwhile, in winter 1934 Lev Kerbel came to Moscow to show his prize-winning work – a bas-relief of Lenin to the People’s Commissariat of Education of the RSFSR. There he was received by the first People’s Commissar of Education Bubnov, and then by the widow of Lenin, Deputy People’s Commissar of Education Krupskaya. 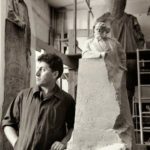 She sent Lev Kerbel with the recommendation to Brodsky, the director of the Russian Academy of Arts in Leningrad, who almost immediately decided to show the young sculptor to S.D. Merkurov. The latter gave a very good review on the competitive work of Kerbel, in the note to Krupskaya: “Comrade L.E. Kerbel is a gifted man, and systematical, correct training will make him a good sculptor”. 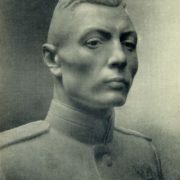 Kerbel came to the People’s Commissariat of Education of the RSFSR in Leningrad (March 1935), where he was enrolled in the preparatory class of the All-Russian Academy of Arts. 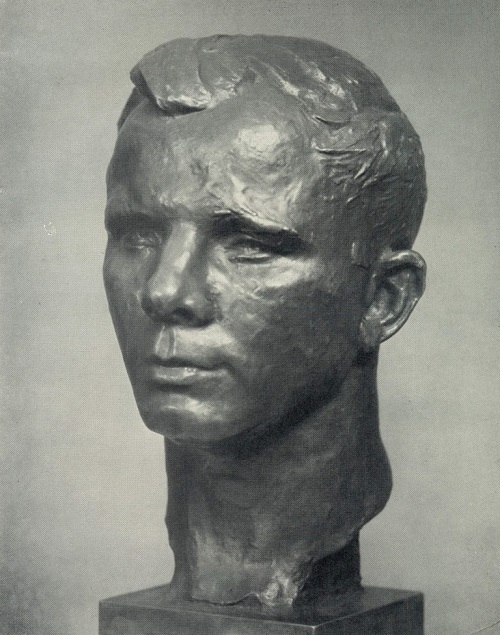 And in September 1937 he became a student of I course of sculpture department of the Moscow Institute of Painting, Sculpture, Architecture and Arts. Meanwhile, in summer, the young artist worked as the head of children’s and art circles in pioneer camps, including “Artek”. 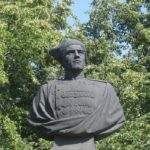 While still a student, Kerbel performed a sculptural portrait of Alexander Pushkin (1937, Museum of Art of Smolensk), for the “Artek” has established a monument to the pioneers. 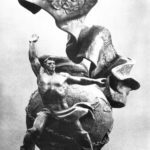 In 1941 he took part in the competition for the monument to Vladimir Mayakovsky, and in the first round won the first prize. The second round was prevented by the start of World War II. The project remained unfinished. However, as the sculptor A.P. 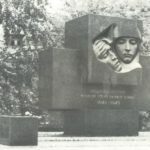 Kibalnikov recalls, his famous monument to Vladimir Mayakovsky at Triumfalnaya Square (up to 1991 – Mayakovsky Square) in Moscow, opened in 1958 in honor of the 65th anniversary of the poet, is partly based on the pre-war model of the monument by Kerbel. 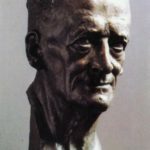 There is no genre of sculpture, in which LE Kerbel did not work: he made portraits and monuments, monumental complexes and mounted compositions. 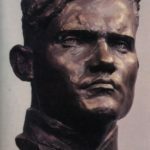 Since the beginning of the Great Patriotic War, Kerbel together with other students and high school students was sent to Komsomol to dig trenches, where he first encountered the front-line setting. However, the front he was not possible to reach in 1941: the institute was evacuated to Samarkand, where Lev Kerbel worked on the construction. Only in 1942, his requests were granted, and Lev Kerbel was called to the Northern Fleet, where he served as a war artist. He participated in the campaigns against the German aggressors, once went to sea on the torpedo boats, it was with the paratroopers who liberated the city of Petsamo. 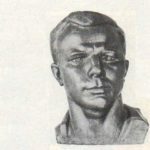 Soviet sculptor Lev Kerbel held service among submariners and pilots of Arctic, whose courage and heroism inspired a young sculptor. 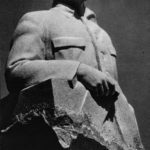 In 1945, the command of the Soviet troops in Germany sent Kerbel to Berlin, where he co-authored with VE Tsigal, completed work on the monument in memory of the heroes of the storming of Berlin, which has been decided to set in Berlin’s Tiergarten park. It was the second time the creation of a memorial to soldiers-winners after the monument in Königsberg. Then Kerbel established monuments to the Soviet Soldier-Liberator in the town of Küstrin on the Seelow Heights, near Berlin. At all stages of his work LE Kerbel implemented the principles of communist ideology in art. 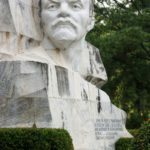 For example, in the works “Labor Reserves” reliefs “Victory Parade”, “Listen to Lenin” (plaster), 1948-1949; Stalin Prize of the first degree (1950); portraits of astronauts; twice Hero of the Soviet Union V. Petrov (marble, 1951), Hero of Socialist Labor KP Mukhtarova (marble, 1954), J. Endicott (bronze, 1957) – all in the Tretyakov Gallery. 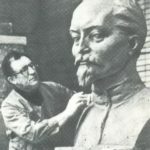 Soviet sculptor Lev Kerbel has worked tirelessly over the image of Lenin, who occupies a leading position in the hierarchy of socialist realism genre. Lenin creations by Kerbel are extraordinarily diverse. It consists of all the portraits of the leader and monuments, including the composition on revolutionary themes. 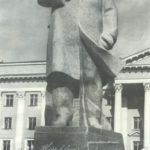 On his projects were put monuments to Vladimir Lenin in Moscow on October Square, Smolensk, Gorki, Kemerovo, Krasnoznamensk, Moscow region, Poltava, Syktyvkar, Lipetsk, Sofia, Havana (co-authored with Antonio Quintana) and other places. Now some of them – dismantled. 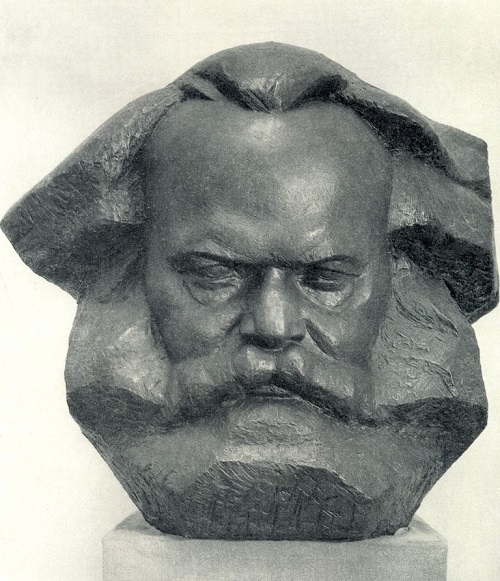 Another important social order for Kerbel became the image of Karl Marx. 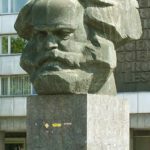 Monuments on Sverdlov Square in Moscow (Lenin Prize, 1962) and in the center of the German city of Karl-Marx-Stadt, for which he was awarded the Order of the Government of the DDR and the USSR Academy of Arts awarded the sculptor with the Gold Medal. In 1976, the Soviet government donated to the Republic of Sri Lanka Monument to the Prime minister Solomon Bandaranaike, the work by Soviet sculptor Lev Kerbel. 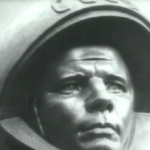 A special place among the works of Soviet sculptor Lev Kerbel take headstones and monuments. 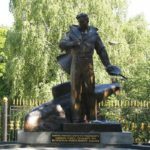 These are monuments to Soviet film director Sergey Bondarchuk, E. Tisse, EA Furtseva, MI Babanova, BA Lavrenev, Admiral A. Golovko, twice Hero of the Soviet Union DA Dragunsky, DF Oistrakh and many other well-known figures. No matter how significant were achievements of the master, his creative plans have always gone on. In the spring of 1986 Kerbel has completed his new great work – a monument in honor of the 100th anniversary of the birth of Ernst Thalmann, who became the center of the architectural ensemble of one of Berlin’s working-class districts. 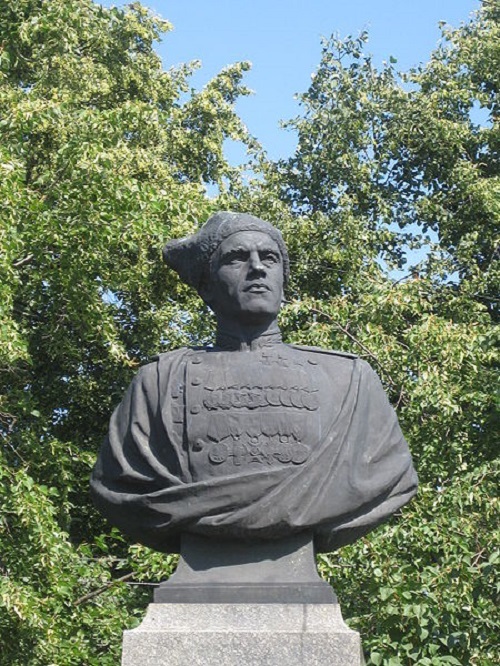 In 1998, a monument to Peter I was opened in Izmailovo. Since 1962, Professor L. Kerbel led workshop of sculpture at Surikov Art Institute. He has trained a galaxy of talented artists working successfully in Russia and abroad. 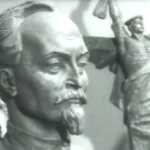 In 1964, at the “Tsentrnauchfilm” studio was made “The first communist” film about the work of Soviet sculptor Lev Kerbel (director V. Tomberg). Kerbel was in many community organizations. He was a member of the Soviet Cultural Foundation Board, the Board of the Union of Artists of the RSFSR, the chairman of the Art Expert Council of the Ministry of Culture of the RSFSR, was a member of various boards and juries. Soviet sculptor Lev Kerbel died in Moscow, buried in the Novodevichy cemetery August 14, 2003. Israel awards, Sri Lanka, Germany. Honorary Citizen of Smolensk and Arctic. *Igor Vasilevich Karev finished antiaircraft artillery school, during the Second World War, fought on the Western Front, the commander of a platoon gunners, covered forward airfields. He fought in the Smolensk region, Belarus, Lithuania, and ended the war in East Prussia. After the war he graduated from the Institute of Decorative and Applied Art. 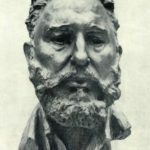 Sculptor, Member of the Union of Artists of the USSR.